Check In: Campers will check-in daily at 8:45am each day at the athletic field. Please allow a few extra minutes on the first day to allow for initial registration. Campers are required to bring their own lunch. Check Out: Campers will check-out each day at 3pm. Manya Steinfeld took the helm of the Loomis Chaffee varsity field hockey team in 2016. Prior to Loomis, she was the assistant field hockey coach at Washington and Jefferson College and Keystone College. In those years, Manya coached four First Team Conference players, five Second Team players and three Honorable Mentions. 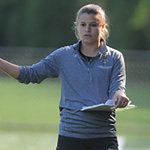 She coached the Empire 8 Rookie of the Year, one All-Region player and two ECAC Players of the Week. The Washington and Jefferson team was a semifinalist for the Empire 8 Conference championship in 2014 and 2015. Manya earned her USA Field Hockey Level 1 Coaching License in 2016. Manya was a four-year defensive starter and two-time captain at Bryn Mawr College. She earned Bryn Mawr’s Rookie of the Year award, Yeager Team Award, and Field Hockey Award as well as being a member of the All-Academic Team for two years. After graduation, Manya spent a year playing with the Copenhagen Field Hockey Club in Copenhagen, Denmark, earning bronze medals for both the indoor and outdoor seasons.